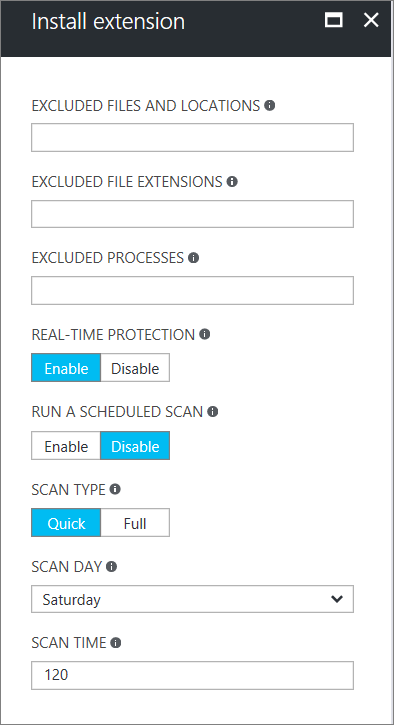 This article provides an overview of VM extensions, prerequisites for using Azure VM extensions, and guidance on how to detect, manage, and remove VM extensions. This article provides generalized information because many VM extensions are available, each with a potentially unique configuration. Extension-specific details can be found in each document specific to the individual extension. Apply PowerShell Desired State configurations to a VM with the DSC extension for Windows. For more information, see Azure Desired State configuration extension. Configure monitoring of a VM with the Microsoft Monitoring Agent VM extension. For more information, see Connect Azure VMs to Azure Monitor logs. Configure an Azure VM by using Chef. For more information, see Automating Azure VM deployment with Chef. Configure monitoring of your Azure infrastructure with the Datadog extension. For more information, see the Datadog blog. In addition to process-specific extensions, a Custom Script extension is available for both Windows and Linux virtual machines. The Custom Script extension for Windows allows any PowerShell script to be run on a VM. Custom scripts are useful for designing Azure deployments that require configuration beyond what native Azure tooling can provide. For more information, see Windows VM Custom Script extension. To handle the extension on the VM, you need the Azure Windows Agent installed. Some individual extensions have prerequisites, such as access to resources or dependencies. The Azure VM agent manages interactions between an Azure VM and the Azure fabric controller. The VM agent is responsible for many functional aspects of deploying and managing Azure VMs, including running VM extensions. The Azure VM agent is preinstalled on Azure Marketplace images, and can be installed manually on supported operating systems. The Azure VM Agent for Windows is known as the Windows Guest agent. For information on supported operating systems and installation instructions, see Azure virtual machine agent. In order to provide the best possible experience, there are minimum versions of the agent. For more information, see this article. The Windows Guest agent runs on multiple OSes, however the extensions framework has a limit for the OSes that extensions. For more information, see this article. Some extensions are not supported across all OSes and may emit Error Code 51, 'Unsupported OS'. Check the individual extension documentation for supportability. Extension packages are downloaded from the Azure Storage extension repository, and extension status uploads are posted to Azure Storage. If you use supported version of the agents, you do not need to allow access to Azure Storage in the VM region, as can use the agent to redirect the communication to the Azure fabric controller for agent communications. If you are on a non-supported version of the agent, you need to allow outbound access to Azure storage in that region from the VM. If you have blocked access to 168.63.129.16 using the guest firewall, then extensions fail irrespective of the above. Agents can only be used to download extension packages and reporting status. For example, if an extension install needs to download a script from GitHub (Custom Script) or needs access to Azure Storage (Azure Backup), then additional firewall/Network Security Group ports need to be opened. Different extensions have different requirements, since they are applications in their own right. For extensions that require access to Azure Storage, you can allow access using Azure NSG Service Tags for Storage. The Windows Guest Agent does not have proxy server support for you to redirect agent traffic requests through. Azure VM extensions run on existing VMs, which is useful when you need to make configuration changes or recover connectivity on an already deployed VM. VM extensions can also be bundled with Azure Resource Manager template deployments. By using extensions with Resource Manager templates, Azure VMs can be deployed and configured without post-deployment intervention. The following methods can be used to run an extension against an existing VM. The following example uses the Custom Script extension to download a script from a GitHub repository onto the target virtual machine and then run the script. For more information on the Custom Script extension, see Custom Script extension overview. -Run "Create-File.ps1" -Location "West US"
The Set-AzVMExtension command can be used to start any VM extension. For more information, see the Set-AzVMExtension reference. VM extensions can be applied to an existing VM through the Azure portal. Select the VM in the portal, choose Extensions, then select Add. Choose the extension you want from the list of available extensions and follow the instructions in the wizard. VM extensions can be added to an Azure Resource Manager template and executed with the deployment of the template. When you deploy an extension with a template, you can create fully configured Azure deployments. For example, the following JSON is taken from a Resource Manager template deploys a set of load-balanced VMs and an Azure SQL database, then installs a .NET Core application on each VM. The VM extension takes care of the software installation. For more information, see the full Resource Manager template. "commandToExecute": "[concat('powershell -ExecutionPolicy Unrestricted -File configure-music-app.ps1 -user ',parameters('adminUsername'),' -password ',parameters('adminPassword'),' -sqlserver ',variables('musicstoresqlName'),'.database.windows.net')]"
For more information on creating Resource Manager templates, see Authoring Azure Resource Manager templates with Windows VM extensions. When you run a VM extension, it may be necessary to include sensitive information such as credentials, storage account names, and storage account access keys. Many VM extensions include a protected configuration that encrypts data and only decrypts it inside the target VM. Each extension has a specific protected configuration schema, and each is detailed in extension-specific documentation. How do agents and extensions get updated? The Agents and Extensions share the same update mechanism. Some updates do not require additional firewall rules. Publishers make updates available to regions at different times, so it is possible you can have VMs in different regions on different versions. $vm = Get-AzVM -ResourceGroupName "myResourceGroup" -VMName "myVM"
The Windows Guest Agent only contains Extension Handling code, the Windows Provisioning code is separate. You can uninstall the Windows Guest Agent. You cannot disable the automatic update of the Window Guest Agent. The Extension Handling code is responsible for communicating with the Azure fabric, and handling the VM extensions operations such as installs, reporting status, updating the individual extensions, and removing them. Updates contain security fixes, bug fixes, and enhancements to the Extension Handling code. To check what version you are running, see Detecting installed Windows Guest Agent. To get the latest minor release bug fixes, it is highly recommended that you always select auto update in your extension deployments. Hotfix updates that carry security or key bug fixes cannot be opted out. To perform its tasks, the agent needs to run as Local System. Each VM extension may have troubleshooting steps specific to the extension. For example, when you use the Custom Script extension, script execution details can be found locally on the VM where the extension was run. Any extension-specific troubleshooting steps are detailed in extension-specific documentation. The following troubleshooting steps apply to all VM extensions. Check extension specific documentation troubleshooting sections for error codes, known issues etc. Look at the system logs. Check for other operations that may have interfered with the extension, such as a long running installation of another application that required exclusive package manager access. Extensions have 20 mins to run (exceptions are the CustomScript extensions, Chef, and DSC that have 90 mins). If your deployment exceeds this time, it is marked as a timeout. The cause of this can be due to low resource VMs, other VM configurations/start up tasks consuming high amounts of resource whilst the extension is trying to provision. Minimum prerequisites not met. Some extensions have dependencies on VM SKUs, such as HPC images. Extensions may require certain networking access requirements, such as communicating to Azure Storage or public services. Other examples could be access to package repositories, running out of disk space, or security restrictions. Exclusive package manager access. In some cases, you may encounter a long running VM configuration and extension installation conflicting, where they both need exclusive access to the package manager. After a VM extension has been run against a VM, use Get-AzVM to return extension status. Substatuses shows that the extension provisioning succeeded, meaning that it successful deployed to the VM, but the execution of the extension inside the VM failed, Substatuses. Extension execution status can also be found in the Azure portal. To view the status of an extension, select the VM, choose Extensions, then select the desired extension. Remove-AzVMExtension -ResourceGroupName "myResourceGroup" -VMName "myVM" -Name "myExtensionName"